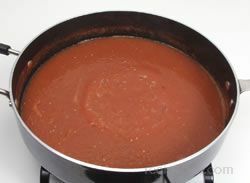 In a saucepan over medium heat, combine tomato sauce and paste. Add remaining ingredients, mix well. Bring to a boil, stirring constantly. Reduce heat; cover and simmer for 1 hour, stirring occasionally. Cool. Pour into freezer containers, leaving 1/2 in. head space. Freeze for up to 12 months. Makes about 4 Cups.